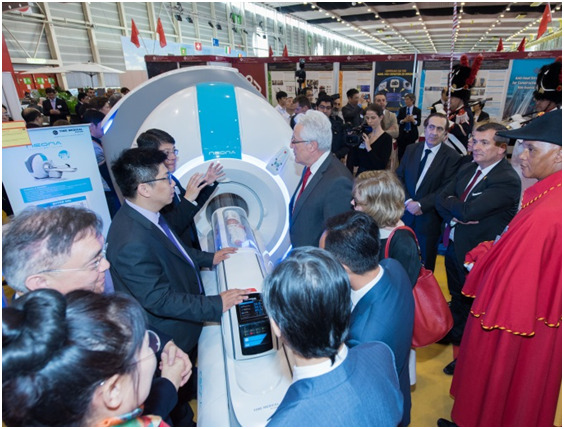 Chengdu, China, May 31 – Time Medical Systems exhibited its first mobile diagnostic imaging system in the 2017 Chengdu Global Innovation and Entrepreneurship Fair opened on May 10, 2017. This mobile diagnostic imaging system combines a digital x-ray machine with a magnetic resonance imaging (MRI) system to form a system with advantages from both imaging techniques: the fast, convenient and affordable from X-ray for preliminary screening, and the high soft tissue contrast resolution, high spatial resolution, freedom of slices at arbitrary orientations, free from ionization radiation, specific techniques on blood and water imaging from MRI, resulting in a wide range of clinical applications. Combined with the remote diagnosis function, the system can serve duties such as performing regular mobile patrol diagnosis, providing emergency rescue services, offering training for basic medical personnel, etc. The system is aimed at alleviating the lack of medical resources problem at the remote areas and in Mid-West China, and at the same time helps to achieve the goal of strengthening primary medical services and provide targeted medical treatment for the unfortunates. The system can not only be deployed for mobile diagnosis, but can also be fixed on the ground independently as a semi-mobile imaging center. Moreover, options such as portable electrocardiograph machine and B-scan ultrasound system are also available. These highly extensible features allow applications at various situations. The China-made high-end medical equipment can be exported to countries and regions along the routes of The Belt and Road – benefiting more people in different countries. Time Medical’s mobile diagnostic imaging system has aroused wide attention at the Fair. Li Yin, Governor of Sichuan Provincial People's Government, Qiang Luo, Mayor of Chengdu Municipal People's Government and other officials visited the booth. Professor Qiyuan Ma, President of China Association for Science and Technology Returnee Entrepreneurship Association and CEO of Time Medical Systems introduced the mobile diagnostic imaging system from Time Medical Systems to leaders of Sichuan Province and Chengdu City. Governor Yin asked about the details of the system such as type of machine equipped, weights of the mobile system, and the expected service price in remote areas. Governor Yin highly praised Time Medical for its spirit of innovation and showed recognition to the project. He believed the system can practically solve the hierarchical medical treatment problem in Mid-West China and remote areas. Today, Time Medical Systems completed the first PANION PRO Veterinary MRI installation in Hong Kong. Congratulations to HVVC for the opening of the MRI and Rehab Centre! This marks the beginning of a new page for Time Medical in the dedicated veterinary MRI Market. Geneva, Switzerland, 15th April 2016 – Time Medical participated in the Inventions Geneva 2016 with the NEONA - World’s First Neonatal MRI System and won the Prix de l’Etat de Genève award which is also the highest award among the medical class on 15th April 2016. Inventions Geneva is the world most important IP convention. It is organized by Swiss Federal Government, The State of Geneva and the World Intellectual Property Organization (WIPO). 2016 Inventions Geneva has 752 exhibitors from 48 counties with over thousand inventions and products. The event attracted over 59,000 people and over 650 media reporters. Today, Time Medical successfully energized to full field its first - 7T Horizontal Bore Magnet, in its China Medical City facility. 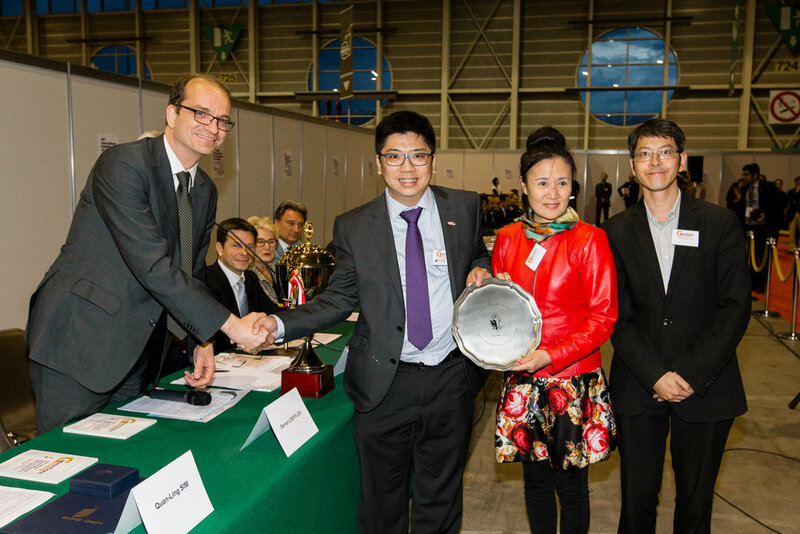 This is an important milestone in the development and manufacturing process of Time Medical's overall MR program and marks the birth of the first Asian-made Ultra-High Field 7T magnet. Intended for the preclinical, small animal MR research market, this 7T magnet was specially designed with several critical factors: zero liquid helium boil-off; stable magnetic field decay; and high homogeneity. This successful 7T magnet development further demonstrates that Time Medical is an Innovation leader with great potential in many MR areas, such as the ultra-high field MR market. In addition, Time Medical's HTS (High Temperature Superconducting) RF coil technology will greatly enhance the imaging quality of the 7T MR system and surely benefit its client partners working in many diverse - R&D areas. Ultra high field MR equipment provides MRI, MRS and NMR capabilities for many areas of Biomedical and Pharmaceutical research, commercial and academic. This is a multi-billion US dollar global market. Designed and developed by Anhui Time Medical Imaging Technology Co., Ltd., the digital radiography (DR) x-ray imaging system -- RORA 3000, is targeted to higher level and more demanding x-ray applications and clinical users. RORA 3000’s large-capacity, high-quality x-ray tube ensures low dosage x-ray exposure, yet offers highest level image quality even under heavy workload requirements, satisfying clinical applications for mid- and high-end hospitals. The R & D team developed TM’s first DR product at an accelerated pace. The CFDA approval of RORA 3000 within a year from start is a noteworthy accomplishment and milestone for Time Medical. This new DR product advances TM’s product portfolio as a leading medical imaging equipment player, and also satisfies the demand of many customers both in China and other Global markets.